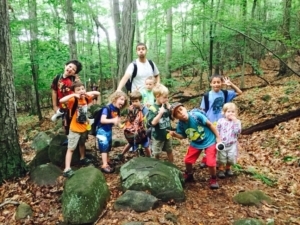 Treehouse Camp is only offered in two-week blocks. This longer camp session allows a group of campers to make stronger friendship connections and enjoy a wider range of favorite camp activities! If you need individual weeks of camp and a two-week block does not work for your schedule, please see SPROUTS CAMP, SAPLINGS CAMP, AMAZING ANIMALS CAMP, COOKING CAMP, or RANGERS CAMP. Home base for our Treehouse Campers is at our “treehouse cabin” in the woods! This special gathering place is the launching point for daily adventures. Our Treehouse Campers explore all the favorite activities at Common Ground Camp: visiting the farm animals, nibbling in the children’s garden, digging in the mud kitchen, going on hikes, wading in the stream, building forts, hanging out at the campfire, and playing with friends. The primary difference between TREEHOUSE CAMP and ADVENTURE CAMP is that Treehouse Camp is for a MIXED AGE GROUP and Adventure Camp is divided into an older and younger group who spend their days separately. Both camps do a little bit of everything that Common Ground has to offer! The mixed age group in Treehouse Camp allows siblings/cousins/friends of different ages to register for a camp together! Not all of our Treehouse Campers will register with a friend or family member – this camp is also a great choice for any child who enjoys playing with a wide age range of peers. At Common Ground we love mixed age groups – they offer leadership opportunities for older children, a range of peers to play with for younger children, and often see lower social conflict and more collaborative play than groups made up entirely of same-age peers. Our Treehouse Camp teachers are professionals who have lots of experience with children and boundless enthusiasm for outdoor play and exploration! Teachers are assisted by high school student counselors. The group is also joined by junior counselors (13+ year old volunteers), so we have lots of helpers available. Please see the “Frequently Asked Questions” page for more details on the qualifications of our camp staff. Interested in multiple weeks of camp? 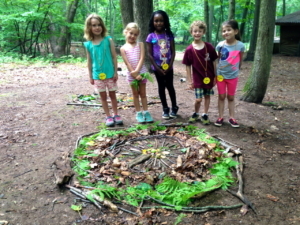 Check out Ecology Camp (ages 5-12) — six weeks of adventures with a consistent peer group, plus field trips and special events!